Is Jupiter Earth’s Friend or Foe? 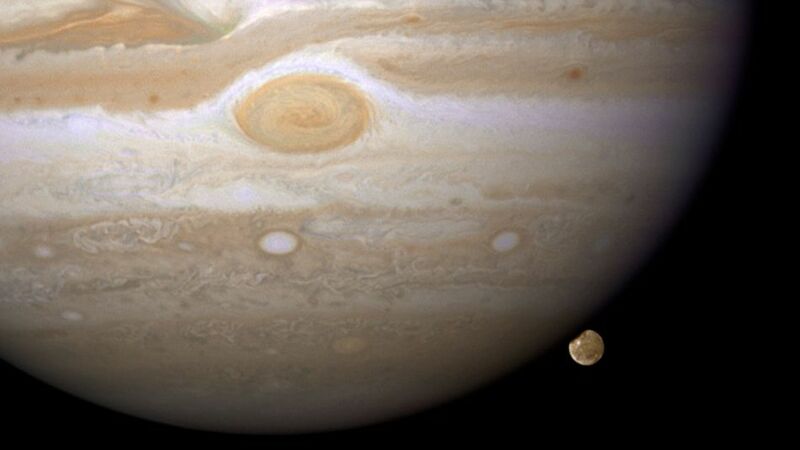 Jupiter’s largest moon, Ganymede, ducks behind the red giant once every seven days. Is Jupiter a friendly planet, Earth’s enemy, or perhaps both? For decades, scientists have talked about how the giant gas planet keeps some asteroids from striking our small world, while others have pointed out that Jupiter’s gravity could send some civilization-shattering asteroids our way. While that debate goes on, a subtler question arises about how influential Jupiter was in the early Solar System. Jupiter is by far the heavyweight planet in the Solar System, weighing in at 320 Earth masses. Its gravity not only influences small asteroids that go by, but also tugs on other planets in the solar system – including our own. What if Jupiter had had a more eccentric orbit? Could that have affected the habitability of Earth? A new peer-reviewed study published on preprint site Arxiv, called “The role of Jupiter in driving Earth’s orbital evolution,” examines these questions in more detail. It was presented at the Australian Space Science Conference. At first blush it appears Jupiter’s position in the solar system could vary greatly without hurting life’s beginnings as we know it, but more studies of how other planets influence Earth’s climate are needed before we can better understand what’s going on, the researchers said. Depending on how Jupiter interacts with Earth in different scenarios, Earth’s orbit could vary dramatically, thereby influencing the amount of sun we receive on the surface. Once we begin to figure out the ranges of habitability in the models, this could help us narrow the search for other habitable planets outside the Solar System that have gas giants nearby. Surveys with NASA’s Kepler space telescope and other observatories reveal one great truth about planets: they tend to form in groups. Most planets outside the solar system are found with companions. We’ve also seen an array of planetary systems, including those where gas giants known as “Hot Jupiters” are close to their parent star. The search for habitability is often focused on finding rocky planets or moons similar in size to the Earth, and ones orbiting at the right distance from a star to make liquid water possible. However, other factors include the variability of a planet’s orbit, or the tilt of its poles, both of which could be influenced by bigger planets in that planet’s solar system. Researchers got interested in the effects of nearby planets on life after observing the Moon. Certainly, if you suddenly took the Moon away, the Earth’s axis would destabilize. But Waltham said the better question is to ask what would happen if there was a larger moon from the beginning. “Any initially stable planet will eventually become unstable as its spin slows but, without a moon, this could take tens or hundreds of billions of years,” Waltham said. In a nutshell, taking the Moon away today is not the same thing as not having a Moon in the first place. We’ve had 4.5 billion years of lunar-generated spin-deceleration. From there, Waltham began considering scenarios where moons would not destabilize a planet as quickly. One of them would be if the solar system was precessing, or moving, more slowly. This led him to wonder about the influence of other planets on Earth, a question also preoccupying Jonti Horner, an astronomer and astrobiologist at the University of Southern Queensland, who is affiliated with the Australian Centre for Astrobiology. The researchers ran models of our Solar System. With each iteration, seven of the eight planets in the solar system are in the same starting conditions in terms of mass, location and orbit. The eighth, Jupiter, kept the same mass but was moved around in various ways. The researchers used different orbital eccentricities ranging from perfectly circular to orbits that are moderately eccentric, or elliptical, where Jupiter’s closest and furthest distances range 20 percent further than usual. In distance terms, this means Jupiter would rove as much as two astronomical units or Earth-sun distances in its orbit, ranging from 4.2 AU from the Sun to 6.2 AU from the sun. In addition, the authors moved the entire orbit of Jupiter inwards and outwards (testing what would happen if it had formed closer to the Sun, or further away), and at each new location, again tested a range of orbital eccentricities between circular and moderately eccentric. This meant that, in their most extreme close-in scenario, Jupiter came all the way in to 3.4 AU at perihelion, while in the most extreme distant scenario, it ranged out to over 7.4 AU from the Sun. Using tens of thousands of permutations, Waltham and Horner stepped forward each simulation through a million years of time, recording Earth’s orbital parameters every 100 years and then charting the results. The model showed that most of Jupiter’s locations resulted in little change in Earth’s orbit and tilt, although the effect on Earth’s climate is unclear. Horner said he is working with James Gilmore, a climatologist at University of London, to better understand how changes in the Earth’s tilt or orbit would affect its habitability. Changing the tilt would affect the seasons, while changing the orbit would alter the amount of sun on the surface. Waltham, meanwhile, says there is a discrepancy between the results in this study and a previous one he had done with analytical equations showing that Jupiter’s position has a striking influence on Earth’s climate. While he believes this study is more accurate, he wants to go back to his earlier work to resolve the difference. Although this simulation dealt specifically with the Earth-Jupiter relationship, there are implications for worlds that are beyond our Solar System’s reaches, the researchers said. Take solar systems that are comprised of planets orbiting in spaces as small as Mercury’s orbit of the Sun. That said, he warns there are no “absolute rules” about habitability. There could be scenarios where the axis moves too quickly for complex life to keep up, but simple life forms such as bacteria are be able to evolve fast enough to adapt to temperature changes. Horner, meanwhile, is examining scenarios under which giant planets send giant impactors, such as asteroids, towards inner planets. For Earth, a Jupiter-sized planet is both a good and a bad thing. The gas giant absorbs some impacts from meteorites, but also alters the orbits of small bodies and could send them towards Earth. He added that the new research underscores how a small change in parameters could change habitability wildly, pointing to the need to look at more solar systems in formation to see under what conditions planets form. Examining new solar systems will be a strength of NASA’s forthcoming James Webb Space Telescope, which is launching into space in 2018. Horner emphasized that the numerous simulations his team ran on Jupiter’s influence in the solar system shows that where planets end up is often a result of chance as much as physics.